Spirit of Scotland Travelpass: Is it worth it? The Spirit of Scotland travelpass is pre-dominantly a rail rover ticket (similar to a Eurail pass in mainland Europe) where one can take unlimited train & ferry journeys along with a few bus journeys for £134 (4 days) / £179.70 (8 days). I used not one but two travel passes in succession (lasting 1 month - July 2016) in my attempt to see as much of Scotland as possible by public transport. I came to the conclusion that the travelpass in its current form is NOT worth it for travellers using the pass to see Scotland's sights. I'll describe my experience with 3 suggestions on how the pass can be improved. I'd love to hear your experiences using the pass. Convenience: You can go to any station, look at departure boards, decide which train to take & hop on quickly. Similarly no queues for CalMac ferries. This pass is totally worth it for making more than 1 train journey a day multiple times. Cost: The pass definitely costed me more than what buying individual tickets would have costed me (I did the math, the current winter discount price works better). This is because the CalMac fares are much lower than 2 years back for foot passengers plus I ended up paying a bunch out of pocket anyway for the many bus journeys you must take. Major destinations need extra money: Here is a list of top Scotland attractions I went where the pass takes you close to the destination but you'll need to catch another bus AND pay for it to get there: Eilean Donan castle (Dornie), Glencoe, Aberlour, Torridon, Orkney Islands, Luss (Loch Lomond). I must add that this borders on false advertising as Eilean Donan castle & Glencoe feature on Spirit of Scotland leaflets & ads but based on the current routing rules, it is impossible to get to them by using the pass alone. Extremely limited options: Scotland's public transport services are quite limited and certain journeys only have exactly 1 specific set of connections available. If one connection's missed, the day is lost. Poor pass validity awareness for buses: I found myself arguing atleast 3 times where I thought the pass should have allowed free travel but did not due to nuances. Ex: Inverness to Fort William by the 18:15 Stagecoach bus is not free because its not operated by Citylink but thats the only bus you can catch if you leave Stromness at 10 AM the same day & take the train from Thurso to Inverness. Arguments after 8 hours of travelling are not fun. 1. Reduce the price or simplify the routing : The 4 day travelpass is absolutely overpriced, I'd like to see a practical itinerary someone actually did where it would cost more to buy tickets individually. My suggestion is to either reduce the pricing so it makes financial sense to buy the pass OR raise the price to say £200 for 8 days but all buses are free where trains + ferries physically cannot take you. 2. Improve travelpass knowledge for bus employees : I resorted to carrying a screenshot of the rules to show to bus drivers on this trip to reduce arguments on pass validity. VisitScotland would really help travellers if all bus drivers in the country were properly imparted the knowledge of this pass (many drivers squinted on seeing my passes as they've seen it so infrequently). 3. Stop the false advertising : Showing pictures of places travellers cannot get to for free using the travelpass (Eilean Donan only gets to Kyle, Glencoe only gets to Ballachulish) on your advertising bugged me the most. The leaflet should state this fact. I'd be more than happy to describe specific details / anecdotes to anyone at VisitScotland who'd like to hear some constructive feedback on a well-intentioned travelpass. Tagging @VisitScotlandAmanda as she's currently the most active on the forum. What are your experiences of using the Spirit of Scotland travelpass? Did I miss a trick in usage or am being too harsh on the pass? I'd love to know and it would help future travelpass users! Hi @Horizons, thanks for your detailed and informative post! · Discounted travel passes for travellers aged between 16-25, senior citizens & disabled citizens. There is a 50% discount for children aged between 5-15 and under 5’s travel free on full-priced travel passes. I’ve just noticed that currently they are offering 20% off in their winter sale, which helps improve the cost benefits as well. Alternatively, if this pass doesn’t work for you there are other passes they offer which might better suit your needs, such as the Highland Rover or the Central Scotland Rover. In terms of what to do with the learnings from your experience it might be worth reaching out to ScotRail directly, which you can do here. I spent five weeks in spring 2016 travelling around the country using public transportation. I researched the myriad of travel passes extensively prior to my trip as some required purchasing before arriving in Scotland. They aren't that affordable. I decided to use the pay-as-you-go method and covered ground from Hadrian's Wall to Orkney, St. Abbs to Skye. Some routes were tricky; "You can't get there from here" instances. Do your research and don't assume services run seven days a week. However, I made it work and I saved hundreds of pounds and wasn't limited to travelling 4 out of 8 or 8 out of 16 days, as some set passes mandate. In some locations, Megabus fares were only £1 - £3. In the larger cities or within counties, the ride-all-day tickets were extremely affordable and convenient. I pre-booked rail travel online 24+ hours in advance for cheaper fares, collected tickets at the stations or, if no ticket box, showed the purchase confirmation (on my cell phone) to the conductor. The only place I hired a car was in Portree, so I could get to the more remote areas of Skye. Public transportation on Skye is thin. 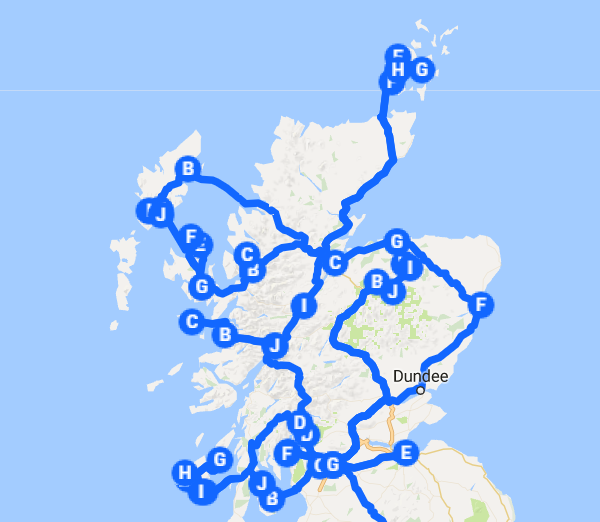 In Orkney, in hindsight, hiring a car would have been useful, however I found the bus routes based out of Kirkwall very workable with only a few times over several days of needing to hitchhike. If I was planning another trip to Scotland would I do it the same way? Yes! On the whole, the public transportation system is very good. Turns out I took 34 train + bus + ferry journeys in 15 days which is a bit crazy. Out of this 1/3rd (11 journeys) were NOT covered by the travel pass (which is one of my gripes). I've also given a cost spreadsheet covering each journey I took. @JulesOutlander I'd love to help you plan a public transport itinerary but am at work right now so I'd suggest you start with this post that covers all the places you'd like to see that you mention and some more in a week including some public transport timings. It starts off with links to all the public transport agencies that will help you plan your trip. If you have specific questions past that, I'll be happy to answer them. Drop me a message through the forum or on my Facebook page linked below. My opinion still holds true that the Spirit of Scotland pass will be costing more than individual journeys so I'd still recommend buying tickets before your journey. Lastly, if you are here for a long-ish time (say 2 weeks) and want the train to be your primary mode of transport, I highly recommend buying a Two-Together railcard, the £30 cost is easily recovered in a few rail journeys (especially if you have any plans of seeing the rest of the UK outside of Scotland). An alternative to Scotrail passes is the Citylink Explorer Pass. There are 3 choices (3 days out of 5, 5 days out of 10 and 8 days out of 16) which are very well priced. It's often the case that the 3 day pass works out cheaper than a return journey to Skye for instance. Although it doesn't cover the whole of Scotland, it serves the main destinations and offers discounts on some other routes not included in the pass - for example 50% off the Shiel bus service between Fort William and Mallaig and 10% off a lot of Stagecoach services. It comes with other discounts such as 20% off Northlink and Stena Line Ferries, free membership of the SYHA Hostelling Scotland and £1.50 off the City Sightseeing Tour in Edinburgh, Glasgow and Oban. This pass is a very popular option and is for sale in the Edinburgh iCentre or online. 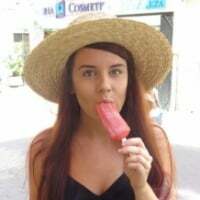 @VisitScotlandMuriel The pass looks awesome, the cost is on point and free SYHA membership is a nice bonus for backpackers. Would love to use it on a trip to the West Coast next year.